It has been great to see so much hard work and creativity going on at Dame Tipping this week. I have had the opportunity to see all the children at work, as has Ms Holmes. 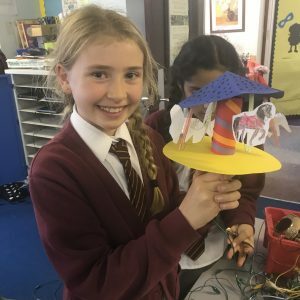 We have both been very impressed with the children’s excellent learning behaviour, their level of independence and with how clearly they are able to talk about their learning and their experiences at school. 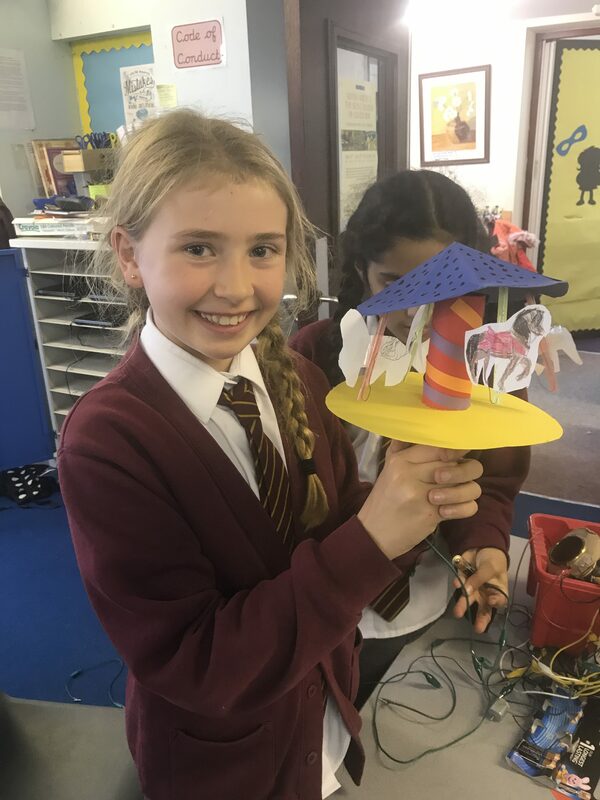 Class 5 and 6 had a DT day on Wednesday, where they made working carousels to round off their Fairground topic. Thank you to Mrs. McCormack’s parents for coming in and helping out. Children from KS2 took part in the Havering Cross Country competition this week. Here is what they said : ‘I came 58th and I was very proud.’ (Jack Wallis) ; ‘It was fun !’ (Jack Webb) ; ‘It was very fun and hard, but I kept persevering and came 32nd.’ (Aaron Hick). 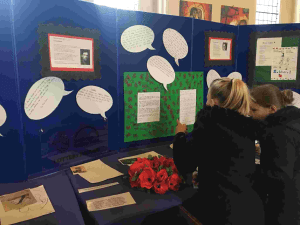 On Thursday this week, year 5 and 6 visited the First World War exhibition at the Ascension Church in Collier Row. The exhibition includes display work by the children, who visited the Imperial War Museum in September. They have produced poems, letters and art work around the theme which are presented alongside research and films of the local soldiers who lost their lives during the war. The exhibition is open to the public over the Remembrance weekend and the church welcomes visitors from 4pm – 8pm on Saturday and 12.30 – 3 pm on Sunday. The children also took part in a Remembrance service of hymns, prayers and readings at St. John’s Church today. I was so impressed with their respectful attitude and their excellent reading. The buildings are starting to go up now and it’s lovely to see the progress that has been made. I will know more about completion dates after the site meeting next week. Next Friday (17th November), we will be supporting Children in Need. Children need to pay £1 to dress up as a Disney, Pixar, Marvel or DC Comics character. There will also be a cake sale, a film and a couple of competitions, so please send your children in with 2 or 3 additional 50ps for these if you can. Thank you. Reception- Archie Ormes and Zack Stafford, for trying their best to write new letter sounds learnt in Phonics. Class 1&2- Miller Davis, for continuing to persevere with his work and being willing to participate and Yoanna Kitanova, for her excellent attitude in maths. Class 3&4- Jack Webb, for being a superstar all week and making brilliant progress in reading and maths. Class 5&6- Albert Gilbert, for writing a prayer for Remembrance Day to read at the service. Reception- Thea Shorter, for using ‘robot hands’ to blend and segment CVC words. Class 1&2- Isabelle Mahoney, for excellent work in maths and using the part, part, whole model. Class 3&4- Fae Dignum, for amazing work all week on solving bar modelling problems. Class 5&6- Ruth Airen, for creating a lively section of well-punctuated dialogue. Congratulations to Freddy Parrish for coming 1st in his horse riding show and to Tommy Randall, George Viney, Lexi Webb, Paul Olusegun, Kai Davis and Kai Boorman for winning their football match at Tommy’s party. Pen licences were awarded to Milo Shorter, Naa Dedei Osaji-Okai, Poppy Whitcombe and Caleb Chen for consistently neat, cursive writing. Congratulations, Class 5 and 6 ! Wednesday 13th December- Dame Tipping Gospel Choir Christmas singalong evening.